These mini oreo cheesecake cupcakes might be short on size, but they are twice as tasty. 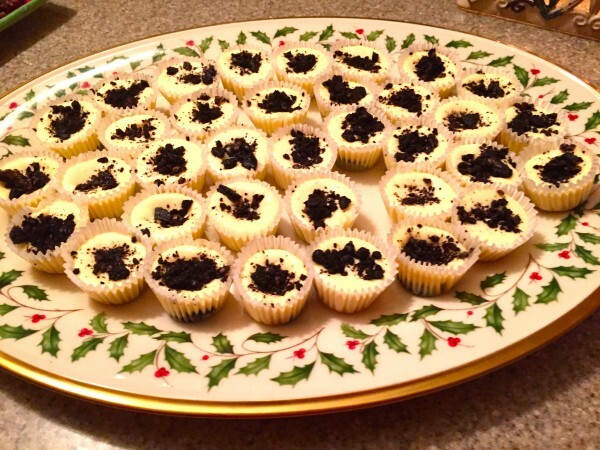 Some mini cheesecake recipes are not baked, but this one was. Enjoy! If you are like me, the last thing on your mind after Thanksgiving will be dessert. But, whatever you do, bookmark this page or print out this recipe for later, because you will love these delicious cookies and cream bites of heaven. 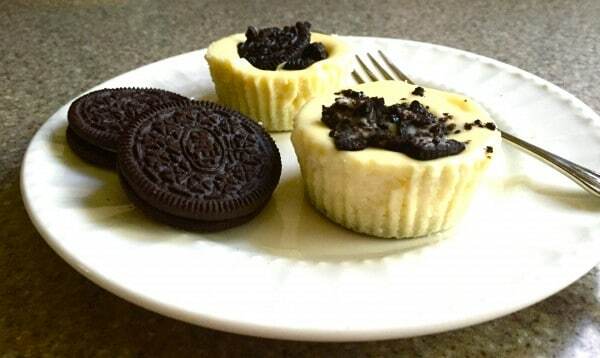 Not only is this mini oreo cheesecake cupcakes really easy to make, but they are just the right size for a light dessert or snack and if you have any leftovers, they can be frozen. 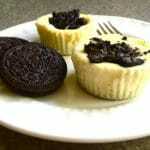 But, back to how to make this mini oreo cheesecake cupcakes recipe. First gather your ingredients which include: Oreo cookies, cream cheese, granulated sugar, vanilla extract, eggs, sour cream and salt. You will also need a regular size muffin pan and muffin paper liners. 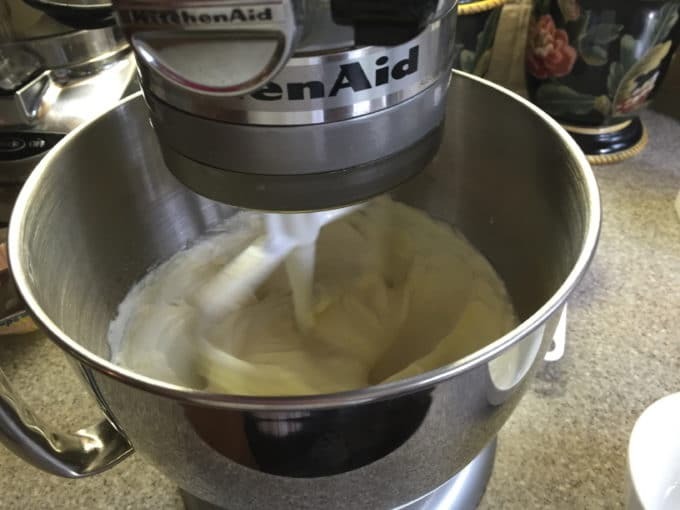 Use your mixer to beat the cream cheese until smooth. Add the sugar and beat until combined. Add the eggs, one at a time and then add sour cream, vanilla and salt. Mix well. 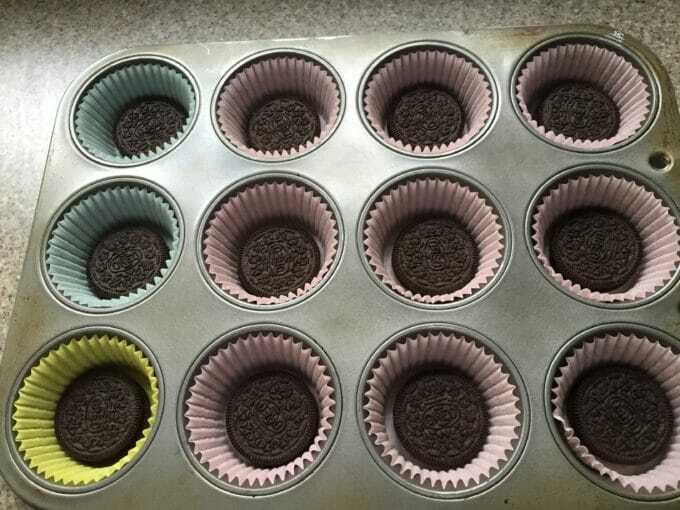 Place paper liners in a regular size muffin pan and then place 1 Oreo in the bottom of each cup for the crust. Using an ice-cream scoop if you have one, put a good size scoop of the cream cheese mixture in each muffin cup filling each one almost to the top. 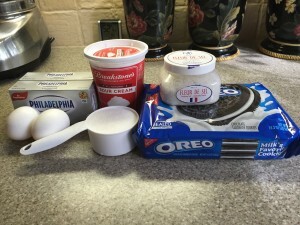 Crumble about 6-7 Oreos and sprinkle on the top of the cream cheese mixture in each cup. Bake at 275 degrees for 22-25 minutes or just until the filling is set. Do not over-bake. When done, transfer your pans to a wire rack to cool completely and then place in the refrigerator for at least 4 hours or overnight. You can also use a mini-muffin pan to make delicious bite size bits of heaven. 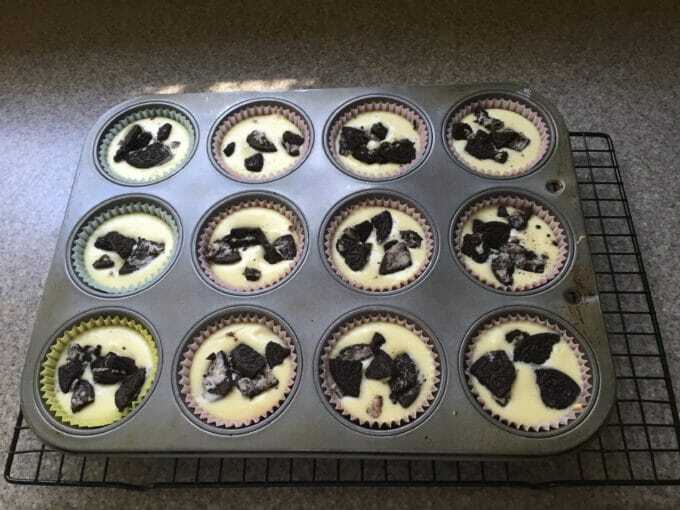 If you use a mini-muffin pan, use mini Oreos. This recipe makes 48 mini-sized cheesecakes. 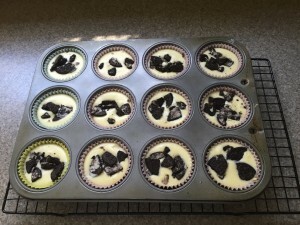 Did you like this mini oreo cheesecake cupcakes recipe? Don’t forget to leave a comment and share with your friends. Delicious! Add sugar and eggs, one egg at a time. Mix well. Beat in vanilla, sour cream and salt. Mix well. Put paper liners in your muffin cups and place 1 Oreo in the bottom of all of the cups. Using a 1 1/2 inch ice scream scoop fill each cup almost to the top with the cream cheese mixture. Crumble 6-7 Oreos and sprinkle over the top of each cup. Bake for 22-25 minutes or until the filling is just set. Cool completely on wire racks and refrigerate for at least 4 hours or up to 24 hours. May be frozen for up to 1 month or stored in the fridge for up to 3 days. If frozen, defrost in the fridge overnight before serving. *To bring your cream cheese to room temperature, unwrap and place cream cheese in a microwave safe dish, and microwave for 30 seconds. *To bring your eggs to room temperature, place eggs in a bowl of hot water for 10 minutes.